Somebody (and I will point fingers) had way too much time on her hands during the weeks leading up to Halloween. This super-detailed, super-funny (and hopefully super-light) AT-AT pet costume was created by Katie Mello for her dog Bones — that is, an All Terrain Armored Transport as seen in The Empire Strikes Back. Mello is one of the Star Wars-loving artists over at LAIKA/house, a Portland animation studio. Let this inspire you to get your creative DIY juices flowing, and avoid slapping Fido between two oversized hot dog buns this Halloween. Somebody (and I will point fingers) had way too much time on her hands during the weeks leading up to Halloween. 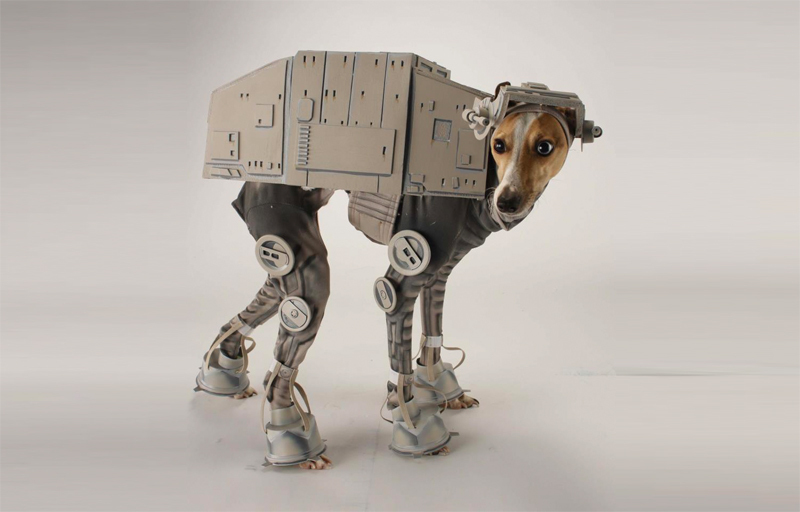 This super-detailed, super-funny (and hopefully super-light) AT-AT pet costume was created by Katie Mello for her dog Bones -- that is, an All Terrain Armored Transport as seen in The Empire Strikes Back. Mello is one of the Star Wars-loving artists over at LAIKA/house, a Portland animation studio. Let this inspire you to get your creative DIY juices flowing, and avoid slapping Fido between two oversized hot dog buns this Halloween.